First of all I have to explain, for those of you that do not know me, I have the attention span of a gnat. I get bored easily and always have more ideas than I have time. With this revelation in mind I hope you will forgive me for putting aside my pastel paper piecing blocks and starting a new project… Starry Night. I had the idea for this series of blocks the other day while watching an episode of “Face Off” and after seeing Quilts of a Feathers fabulous WIP Tardis quilt, and just had to run with it. Then I discovered that Quilting on the Square had added a six more free blocks to it’s Compass collection and it seemed like Kismet. I promptly picked the Rolling Compass block pattern (block3countryregister) and went to work. Another fairly simple star pattern with just 40 pieces, but once again the scraps make it look more complex than it is. I think this is going to be a fun quilt to make. ps. last night my husband did a very technical spreadsheet thingy and choose a winner of Give Away. Congrats to Melintheattic. A bundle of fun goodies will be winging their way to you soon. And thanks to everyone for the kind comments left on the site… made me feel all mushy. Love the colour placement, you really made the star pop. So…. if you have the attention span of a gnat, how come you’ve got the patience to do that inhumanly perfect, all-the-points-lined-up piecing? What are you taking, and where can I get some? I can take little if the credit for the accuracy. It is all the paper piecing. It makes me look better than I am. This is striking, just like I love it. I love this! I’ve the same attention span (hence all the wips) and this might just be next. attention span of a…. 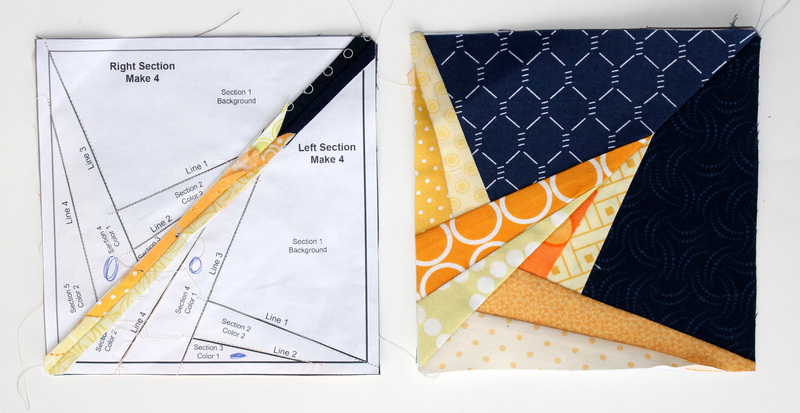 oh shiny… I have no idea what you mean there ::wink:: I love the scrappy yellow and navy together, very stunning! Shiny gets me ever time. How do you get the points to all line up? It’s so pretty! Melanie that is the joy of paper piecing… It makes it so easy to make precise points. There is no other way I could make a block like this. Glad to help. Quilting in the Square has some awesome free star patterns that I have used in the past. I can highly recommend them. I know it is all relative but some of these stars have 100+ pieces so 40 looks very reasonable. Lol. Beautiful! You have a lot of great navy fabric! I love navy. It is my favorite colour and I need to use more of it. I looked at this block and immediately though Van Gogh “Starry Night Over the Rhone” which is awfully nerdy I know, but I think it is quite reasonable to put you and Van Gogh in the same sentence. Can’t wait to see the finished quilt. You flatter me too much but it was my inspiration. I LOVE that painting and it kept being referenced last week in the strangest places. I just had to make my own attempt at a homage. I also thought of Van Gogh. Just keep that rotary cutter away from your ears, Cath. Too funny. Way too funny. Oh I love this star! Can we just surgically insert into my quilt top that is being basted? I cant wait to see where you are going with this quilt! 40 pieces is quite simple? You make these blocks look so amazing. What a beautiful star, and so bright against the dark night sky. Lovely. Wow! Just wow! I’m envious of your stash of navy fabrics! I must confess I like it better too. This star takes 8 different pattern pieces to make. I make all eight pieces , iron then trim them. I then sew the two triangles together to make a square, and repeat till I have 4 squares – you can see that in the second photo on the post. Then I sew two of the squares together, and then the other two squares. You now have two halves of the block. I then sew these halves together, making sure the center seams/center points align. Clear ad mud right! Hope that helps a little. Wow! It’s beautiful. Thinking of 40 pieces makes my legs wobble! Wow! I haven’t tried this method yet….but you’ve definitely inspired me to do so now. Thank you. Your star is gorgeous ! 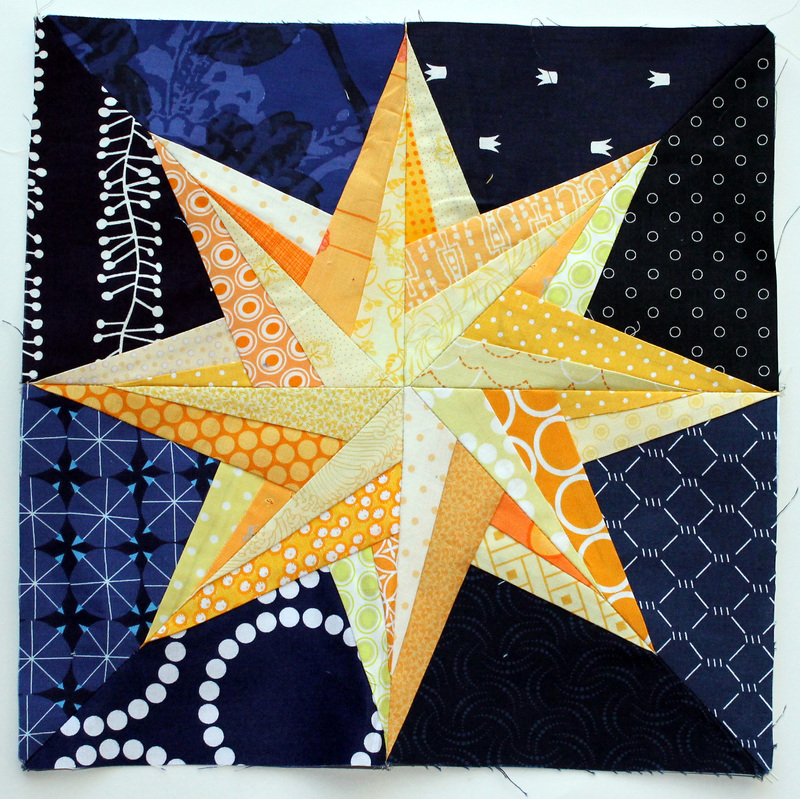 I LOVE the Starry NIght Block…I can’t wait to see what the finished quilt will look like! Van Gogh’s Starry Night is my favorite painting.